← Screwing with your mind: A museum exhibition without a single artifact?? Henry Moore (1898 to 1986) was one of the best known bronze/metal sculptors of our times (click ‘here‘ for short history of the man and the foundation he left behind). He is well-known for his larger-than-life, usually-curvy creations that end up as public sculptures in parks and other public spaces all over the world. When I was in England, I was happy to have not only SEEN but also TOUCHED many of his sculptures that were scattered in open-air public spaces. Contrary to art-in-museums, Moore’s sculptures stand under the sun/snow/rain, and enjoy being affectionately touched by visitors who can get as close to the sculptures as they want. In fact, many sculptures – though naturally corroded to a dark ‘copper’ colour – show signs where certain areas of the metal have been polished ‘shiny’ due to regular human touch. I remember smelling my hands a few hours after touching a Henry Moore, and that metallic scent brought me right back to the park where the Henry Moores and I were acquainted. So what’s this got to do with us here in Singapore? We’ve got a Henry Moore too! If the photo above looks familiar, it is because this Henry Moore ‘Large reclining figure’ has been sitting right below the OCBC building in Chulia Street since the early 1980s. According to the Henry Moore Foundation (click ‘here‘), the designer of the iconic OCBC building, well-know architect I. M. Pei had commissioned it specially for the project. But a quick check with the current status of the sculpture has turned up some good news, albeit a little. If you click ‘here‘, you can see that OCBC has spruced up the area where the sculpture sits. Gone are the rope-barriers (thank goodness!). However, the sculpture now sits SURROUNDED by water! I assume that visitors are to walk around the paved platform, with the water stopping them from getting any closer. So, visually, this Henry Moore can now be viewed in its entirety without the ugly barricades intervening, which is great! But then again, the sculpture remains forlornly untouchable. For the OCBC staff who think that they are doing the sculpture a favour by preventing visitors from going up close, think how much more an impact it could make if they had also allowed visitors to experience it with their sense of touch. 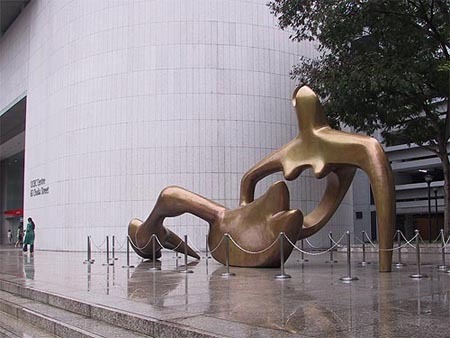 Perhaps this untouchable Henry Moore is a metaphor for the general state of the arts in Singapore. While we Singaporeans are all prepared to ‘explore’ art in this globalised world, some petty arts administrators continue to do things to make our experiences not as fulfilling as they can be. So perhaps a word of advice for OCBC: Free up the Henry Moore from its watery moat, and you will be sure that loads of students, stiff-collared workers, cleaners etc. will have a much better experience of the sculpture, thereby increasing their warm fuzzy feelings about OCBC-bank in the process. Win-Win for both bank and (would-be) customers! !